An analysis of her partial skeleton reveals breaks in her right arm, left shoulder, right ankle and left knee—injuries that researchers say resulted from falling from a high perch such as a tree. Lucy likely died quickly, said John Kappelman, an anthropologist at the University of Texas at Austin, who published the findings Monday in the journal Nature. "I don't think she suffered," Kappelman said. But several other researchers, including Lucy's discoverer, disagree. They contend most of the cracks in Lucy's bones are well documented and came after her death from the fossilization process and natural forces such as erosion. How Lucy met her end has remained a mystery since her well-preserved fossil remains were unearthed more than four decades ago. Her discovery was significant because it allowed scientists to establish that ancient human ancestors walked upright before evolving a big brain. 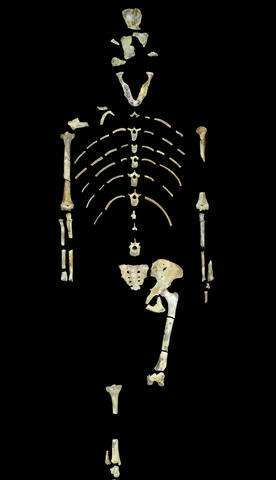 Lucy was a member of Australopithecus afarensis, an early human species that lived in Africa between about 4 million and 3 million years ago. The earliest humans climbed trees and walked on the ground. Lucy walked upright and occasionally used her long, dangling arms to climb trees. She was a young adult when she died. 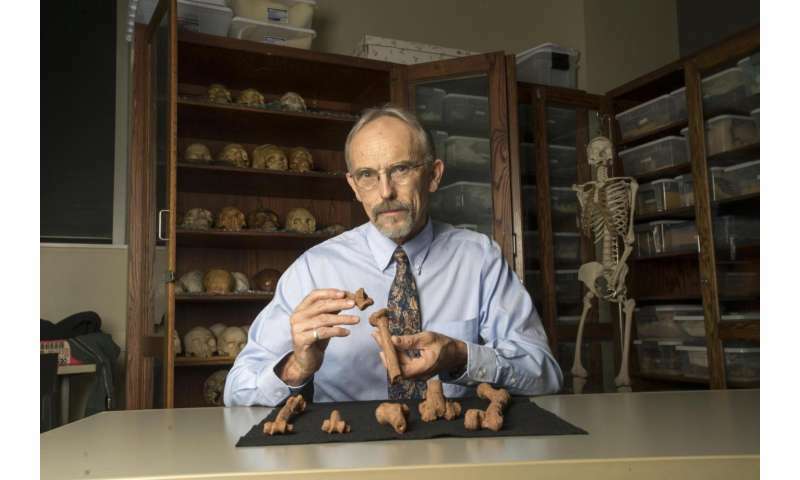 Tim White, a paleoanthropologist at the University of California, Berkeley, called the study's conclusion a "misdiagnosis." The Texas researchers "appear to have focused only on the cracks that they could attribute to an imagined fall, ignoring the additional abundant cracks," White said in an email. The split highlights the difficulty of pinpointing a cause of death from fossilized remains. Scientists rarely know how early humans died because skeletons are incomplete and bones tend to get crushed under sand and rocks. Over the years, Lucy's discoverer Donald Johanson has tried to solve the mystery. Lucy's skeleton, which is 40 percent complete, was recovered in Ethiopia in what was an ancient lake near fossilized remains of crocodiles, turtle eggs and crab claws. "There's no definitive proof of how she died," said Johanson of Arizona State University. 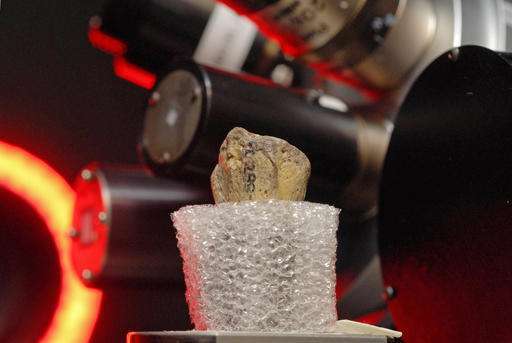 The Texas team examined Lucy's bones and used high-tech imaging. Kappelman said the scans revealed multiple broken bones and no signs of healing, suggesting the injuries occurred around the time of death. He reconstructed her final moments: The 3-foot-6-inch (1.06-meter) Lucy fell from at least 40 feet and hit the ground at 35 mph. She landed on her feet before twisting and falling. Such an impact would have caused internal organ damage. Fractures on her upper arms suggest she tried to break her fall. Kappelman theorized that Lucy's walking ability may have caused her to be less adept at climbing trees, making her more vulnerable to falling from heights. Not everyone agrees that her tree-climbing skills were lacking. Other scientists point out that there have been documented falls by chimpanzees and orangutans, which spend more time in trees than Lucy's species. "Without a time machine, how can one know that she didn't just get unlucky and fall?" William Harcourt-Smith of the American Museum of Natural History said in an email. Lucy had curved hand-bones, which indicate vertical climbing. But was she our direct ancestor? And did she walk upright? She lay in a small slow-moving stream, said Johanson & Taieb (1976): "Fossil preservation at this locality is excellent, remains of delicate items such as crocodile and turtle eggs and crab claws being found." Likely she waded upright (rather than walked on dry ground) not unlike lowland gorillas or bonobos who sometimes wade for shallow-aquatic foods (papyrus, frogbit, waterlilies, papyrus etc.) in wetlands & forest swamps (google "bonobo wading" illustrations). 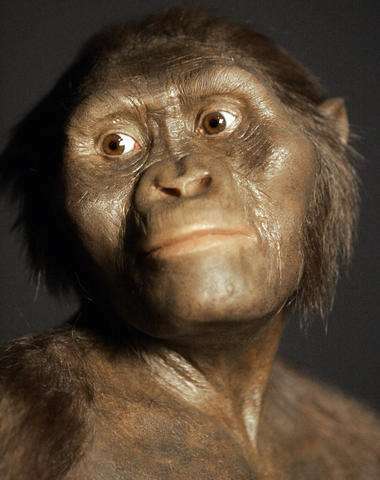 More importantly IMO, Lucy might have been a fossil relative of Pan or Gorilla rather than of Homo. 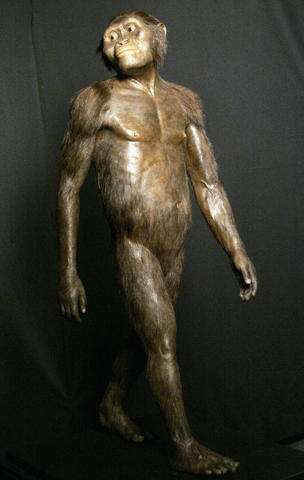 It is traditionally assumed that australopiths were ancestors or relatives of Homo, but not of Pan or Gorilla. This is an example of pre-Darwinian anthropocentrism. Likely, Lucy was a fossil relative of bonobos or gorillas, and waded as well as climbed vertically, like bonobos still do.